Sound "Consistently open, detailed midrange and treble. 'AIR!' say my listening notes enthusiastically." "While the Helix cables weren't adding anything...they were removing something: a layer of noise that other cables were translating as warmth or fullness or some other (often slight) added anomaly." "There is one potentially controversial area of Shunyata cables' performance: the bass, which sounded less weighty than that of the other cables I had been using." use nine individual conductors to create a 14AWG cable. 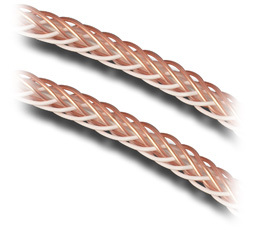 Conductors are "certified CDA-101 copper"
use 16 CDA-101 cryogenically treated conductors to create a 7AWG cable." "Shunyata's Helix geometry is patented and so complex to create that it has to be done by hand. There is no cache of Helix cable from which interconnects or speaker cables are made, no machine that can re-create it." Use "If you hear these cables, be sure you can devote some time to them; you might even borrow them from your dealer a couple of times." In case you haven't noticed, Shunyata Research has become a going concern in high-end -- and professional -- audio. Caelin Gabriel's three years of R&D for what became his PowerSnakes line of power cords began showing rewards in 1998, and Shunyata Research was established. Shortly thereafter, Caelin and Grant Samuelsen, Shunyata's director of marketing, began to build their business the old-fashioned way, by supporting brick-and-mortar retailers and ridding their dealer base of Internet sellers. All along, the cornerstone of Shunyata Research, which now employs 20 full-time staff, has been its power products -- the unique power cords and well-known Hydra power conditioner. My system is rarely playing music without them. A few years ago, Caelin began development on a line of interconnects and speaker cables, producing many prototypes before introducing his earliest signal-carrying cables. I heard some of those first efforts. Their warmish glow was pleasant, but they didn't equal the performance level of Shunyata's power products, which had reached reference status among audiophiles. Later on, I heard Shunyata's Aries interconnects along with Lyra and Andromeda speaker cables. Those cables slugged it out with pricier competition and began to shift Shunyata's acclaim from its power cords and conditioners. Earlier this year, Caelin Gabriel visited me and brought with him a new interconnect and speaker cable -- "just for listening." These had relatively large diameters and were covered in a nondescript black mesh, resembling Shunyata power cords more than any interconnects or speaker cables I've seen. Ho hum, I thought to myself, until Caelin showed me a length of what the mesh was hiding: a series of wires intricately woven around air tubes. If looks could translate to sound, these cables would certainly be interesting -- their geometry was unlike any I'd seen. We put the cables into my system and did some listening. After Caelin left, I listened some more, and then later on let Grant Samuelsen know that I would be writing about these cables, the Antares Helix and Orion Helix. What I was hearing shouldn't be kept a secret. Helix speaker cables and "signal cables," as Shunyata Research calls its interconnects, have been around for a while, but the top-of-the-line Antares Helix and Orion Helix were introduced at CES 2005. A few months later at CEDIA, Shunyata debuted matching power cords, rounding out its power-to-signal Helix lineup. As Shunyata Research's website correctly points out, "All wires have an inherent resistance, inductance and capacitance." Some have postulated that the differences we hear among audio cables boil down to the ratio of these three values to each other. Shunyata Research developed the Helix geometry, which utilizes "Multiple counter-rotating conductors with an offset helix geometry," to minimize all three values. 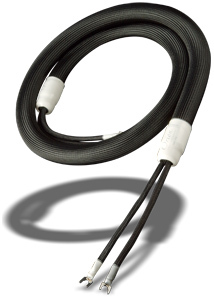 Helix does this by using "wide separation and 90-degree crossing angles to the conductors, which minimizes capacitance. The unique counter-rotating helices that are longitudinally offset create disparate EFF (electromagnetic flux fields) that minimize inductive reactance." The Antares Helix interconnects ($1995 per meter pair) use nine individual conductors to create a 14AWG cable. Conductors are "certified CDA-101 copper," which the US Department of Energy refers to as "pure copper," and cryogenically treated by Shunyata Research. Terminations are Eichmann RCAs that also use CDA-101 copper or Neutrik XLRs with silver pins. 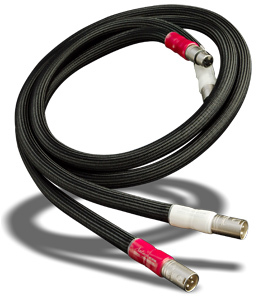 The Orion Helix speaker cables ($4995 per eight-foot pair) use 16 CDA-101 cryogenically treated conductors to create a 7AWG cable. The interconnects and speaker cables are thick but rather supple and easy to work with, even in tight spaces. Their hand-braided nature creates some slight abnormalities -- the interconnects are not perfectly straight, as though they were simply pulled off a spool, cut and terminated. There are very slight kinks here and there, reminding their owner that they are handmade from beginning to end. There aren't too many audio products of any kind to which this applies. Shunyata Research also makes two lower-priced Helix speaker cables and one less-expensive Helix interconnect -- all of which are made by hand. Because I have had the Antares Helix and Orion Helix for much longer time than is usual, I used them with an especially broad range of equipment. Our normal review cycle doesn't allow such a leisurely pace, but this extended review period turned out to be a very good thing, as you will read. I used Antares Helix and Orion Helix for a few extended periods and a number of shorter ones, making sure I put enough signal through them each time to ensure break-in. Speakers were Wilson Audio Alexandria X-2s and MAXX 2s along with Silverline Sonatina IIIs and Merlin TSM-MMs -- two large floorstanders, one smallish floorstander and a minimonitor. Driving the speakers were Lamm ML2.1 SET and M1.2 Reference hybrid monoblocks, along with a Blue Circle BC204 hybrid stereo amp. Preamps were a VTL TL-7.5 or Audio Research Reference 3. Sources were an Audio Research CD3 Mk II CD player, an Esoteric X-01 CD/SACD player, and a Zanden Model 5000 Signature/Model 2000 Premium DAC/transport combo connected with a Zanden I2S digital cable. Power cords for most of the review period were from Shunyata Research -- Anaconda VX and Alpha, older Taipan and Python -- but I also used a number of the new ESP The Essence Reference power cords near the end of my evaluation time. A Shunyata Hydra Model-8 provided power to all of the electronics. Preamps, DAC and integrated digital sources sat on a pair of Michael Green Designs racks, while the Lamm ML2.1s rested first on Silent Running Audio VR3.0 isoBases and then on SRA Ohio Class XL+ platforms. The Zanden digital gear sat on a pair of Harmonic Resolution Systems M3 isolation bases. Whenever the Shunyata Antares Helix and Orion Helix cables were in my system, I noted the consistently open, detailed midrange and treble. "AIR!" say my listening notes enthusiastically. This was something of a surprise, given the golden-hued sonics of the earlier Shunyata cables I had used. I then set about discerning exactly what was happening to make such an impression. The first thing I considered was the most obvious: that the Shunyata Helix cables emphasized the treble and midrange. I played lots of piano and percussion, and I didn't note any highlighting or added energy. Perspective remained unchanged, my system maintaining a truly neutral signature -- neither forward nor laid-back, neither lean nor full, neither cold nor warm. The music, and the soundstage it created, simply seemed more delineated, not in a chiseled way but rather in a way that individual instruments sounded more vivid. Soundstage width and especially depth were impressive as well. Where was all this coming from? If there wasn't a tonal shift, something else had to be happening. Because I knew the review was still a way off, I decided to listen over the course of a few weeks without paying attention to the sound; a number of new CDs helped in this endeavor. Then one afternoon, as I was listening to Buena Vista Social Club [World Circuit/Nonesuch 79478-2], a CD I know well, I made a discovery. While the Helix cables weren't adding anything -- as I had figured out earlier -- they were removing something: a layer of noise that other cables were translating as warmth or fullness or some other (often slight) added anomaly. It took an especially spacious-sounding recording for me to understand this, but there it was. By "noise" I don't mean anything obvious such as a static-like grit or scratchy grain; rather, this is more like what you see when you mix a few drops of oil into a glass of water. A very fine sonic film that seemed to coat every note was greatly reduced or absent. I heard a similar effect with the ultra-expensive Siltech Signature Generation 6 cables I reviewed last year; it was no less there with the Shunyata Helix cables, but their underlying sound seemed less pronounced, less sweet, than that of the Siltech cables, so it was more difficult to distinguish. The lack of this noise made for music that sounded more distinct -- with greater solidity and presence, but not due to some tonal trick. Tina Brooks's True Blue [Blue Note 63373] is still a sought-after eBay find on vinyl, but the new Rudy Van Gelder remastered CD will appease audiophiles who don't want to pay big bucks for the LP. I listened to this CD a number of times with the Shunyata cables in my system, and while the thinness and increased output level of many RVG remasters were still there (they define the sonics of the entire RVG series), the music emerged with poise and authority that made me take notice, even after hearing this CD many times. Using Lamm electronics and Wilson Audio speakers certainly helped the presentation, but I had the distinct feeling that the Shunyata cables were at home with these ancillaries, their equal in so many ways. Vocals glowed with lucidity and directness, yet were missing no presence or punch. Some cables I've heard do a similar thing, but also alter the balance of the presentation. This wasn't the case with the Helix cables, which separated fleshed-out vocals from the instruments surrounding them, illuminating the sound of both in the process. I have a handful of Cassandra Wilson CDs, but I listen almost exclusively to three: Blue Light 'Til Dawn [Blue Note 81357], New Moon Daughter [Blue Note 32861] and Belly of the Sun [Blue Note 35072]. All three rely on Wilson's ability to re-see a song, creating eclectic interpretations that are uniquely her own. The sound of all three CDs is very good as well. I remember listening to "Wichita Lineman" from Belly of the Sun, a cut I've heard many times, and thinking that I was hearing Wilson's voice in its most elemental form -- all dusky subtlety and control of breath -- her essence as a jazz vocalist revealed. Part of Wilson's charm is the songs she picks; most of the Antares Helix's and Orion Helix's charm is their ability to clarify, separating the signal from the noise that otherwise clings to it. There is one potentially controversial area of Shunyata cables' performance: the bass, which sounded less weighty than that of the other cables I had been using. Over the course of time, however, it made the low frequencies of those same cables sound somewhat soggy and smeared -- not nearly as resolved and able to track variations in pitch or the differences among instruments playing in the same range. After much study, I was sure that bass depth wasn't affected -- the Helix cables go as low as any I've heard -- but I wouldn't say that the bass from the Shunyata cables had quite the same density and panache as from the networked cables I've used or the Siltech Signature Generation 6es. You'll have to make the call on this one for yourself; I listened to a great deal of music with the Shunyata cables, and when I swapped them with another set, I would miss their airy delineation and rarely notice their bass. I also asked the inevitable question: Which is correct? The greater weight along with the slight softness and smearing, or the lighter, cleaner low frequencies? I don't know the answer, mostly because I found the entire performance of the Antares Helix and Orion Helix satisfying -- and therefore impossible to dismiss. Because both Shunyata Research and Siltech believe in the efficacy of conductors crossing at 90-degree angles, comparing the Antares Helix and Orion Helix to the latest Siltech Classic-series cables makes sense. Siltech cites noise, or a reduction thereof, for their geometry, which, if you've read this far, you know also happens to be a characteristic of the Shunyata Helix cables. I used pairs of Siltech SQ-110 Classic Mk 2 interconnects ($2600 per meter pair) and LS-188 Classic Mk 2 speaker cables ($5800 per eight-foot pair) during the time I also used the Shunyata cables, so I was able to compare the two sets of cables directly, a couple of times listening to one in the morning and the other in the afternoon. I praised the Siltech Classic cables for sounding "full and sweet while displaying a detailed and spacious presentation," but I also pointed out that they have a more "overtly mellow character" than the pricey Siltech Signature Generation 6 interconnects and speaker cables about which I have also written. Even so, I have turned to the Siltech Classic Mk 2 cables time and again because I enjoy the music they help make. Yes, I can analyze and characterize them, but they sound so good that once the reviewing is done, I simply admire and enjoy them. Fullness, sweetness and mellowness are not characteristics of the Antares Helix and Orion Helix, which sound more truly neutral -- not the washed-out, gauzy sound that so many audiophiles mistake for neutrality. Both the Siltech and Shunyata cables have a sense of composure about their performance, but they come to it in different ways, the Siltech Classic Mk 2 cables through their sweetness and the Shunyata Helix cables from their removal of noise. These traits greatly influence the overall sound of the respective sets of cables, with the Shunyata cables sounding more like direct conduits between components. I rely on my memory when I say that the wildly expensive Siltech Signature interconnects and speaker cables are the very best I've used, but I can say with surety that I would choose Shunyata Helix over Siltech Classic Mk 2. It wouldn't be an easy choice, and I'm sure there would be times when I would wish for the sound of Classic Mk 2, but there you have it. Shunyata Research's Antares Helix and Orion Helix are conundrums. Their reduction in noise makes for some wonderful reproduction, yet their presentation is different enough from the sound of other cables to make you wonder if what they are doing is wholly accurate. I am convinced that for some listeners, they will sound utterly right from the very beginning, while for others they will take some getting used to, which won't happen in a quick in-store demo or perhaps even over a weekend at home. Therefore, if you hear these cables, be sure you can devote some time to them; you might even borrow them from your dealer a couple of times. I am grateful that I had months with them and was able to insert and remove them at will. Both of these things helped me understand and appreciate their performance. In many ways, the Antares Helix and Orion Helix are my very favorite cables, especially in the way they free the music from the noise of the reproduction chain. Even as I write this review, I am still sorting out their low-frequency performance. Is it a bona fide issue or the product of the cables' unique handling of noise? I think it's the latter, but for some listeners it may be the former. No matter -- give the innovative Antares Helix and Orion Helix some heavy time in your system and see if they do it for you as they have for me. Prices: Antares Helix interconnects, $1995 USD per meter pair; Orion Helix speaker cables, $4995 per eight-foot pair.